Video: What Would Universal Healthcare Look Like in the US? According to “Physicians for a National Health Program”, single-payer national health insurance is a system in which a single public or quasi-public agency organizes health care financing, but the delivery of care remains largely in private hands. Under a single-payer system, all residents of the U.S. would be covered for all medically necessary services, including doctor, hospital, preventive, long-term care, mental health, reproductive health care, dental, vision, prescription drug and medical supply costs. To us it sounds like an idea whose time has come. After 241 years of American history, can we not provide every American with the essentials of health care? It would be a step forward in decency, compassion and liveliness. What could be more organic than for every American to provide for the vibrant, good health of every American – that, to our mind, is what single-payer is all about. Here is Professor Dr. David Himmelstein with the City University of New York. He is talking with Jessica Desvarieux. In this inspiring video, a vivacious, young Australian woman gives us a tour of her backyard that she has transformed into a permaculture garden. She has set an example for all of us. In these times, it is essential that each one of us plant a garden, a “victory garden”, if you will, an exemplar of our faith in the wonderful energy and aliveness of our fellow Americans at the grass roots. Place the dates and the filtered water in a measuring cup. Soak for an hour. Place the water and dates into a Vitamix. Add salt, coffee, vanilla powder, and the coffee extract to the container. Blend until creamy smooth. Place the macadamia nuts into a Cuisinart and pulse until you have fine to small pieces. Take a mixing bowl and place the nuts into it. Place the ingredients that are in the Vitamix into the mixing bowl with the nuts. Mix them all together by hand. Take a 7” X 3” cake pan with a removable bottom. Coat the inside of the pan with melted coconut oil. Take 1 cup of the crust ingredients and press it down tightly and flatly with a food press. Cover the pan and set aside. Take the remaining crust and place it onto a chopping block with a teflex sheet. Place another teflex sheet over the top of the crust and roll it out flat with a rolling pin. Form the sides into a square with a flat cake spatula. Place the teflex sheet onto a dehydrator tray. Cover the tray with foil and place it into the refrigerator overnight with the trifle. Place the nut butter, coconut meat, coconut milk, salt, maple syrup, coffee extract and vanilla powder into a Vitamix. Blend with a tamper until the mixture is creamy smooth. Test it with your fingers to make sure there is no grittiness. Slowly turn the Vitamix on low and add in the coconut oil. Make sure it is mixed in evenly using a tamper. Add the sunflower lecithin and blend it until evenly incorporated. Pour this mixture into the cake pan. Tap it repeatedly on the counter until all of the air bubbles are removed. Cover the pan and place it into the refrigerator overnight. Take the remaining filling and place it into an airtight container in the refrigerator overnight. Made from Mission olives, the only olive native to America. (All other olive oils are made from olives originating in Italy, Spain, the Middle East or North Africa.) It originated in California in times long past, coeval with the sabre-toothed tiger and the wooly mammoth. May we suggest that you take a sip and ponder the Cenozoic. This extra virgin olive oil is dry farmed, sustainably, by Darro Grieco – award winning California family farmer. He is the true husbandman of his soil, plants and trees. Darro and Olivia, his soul mate, embue Heritage Olive Oil with their enthusiasm and spirit. (Mercola) Our annual GMO Awareness Week is upon us, and in this interview, Ronnie Cummins, founder of the Organic Consumers Association (OCA) details the current state of the opposition to genetically modified organisms (GMOs). Meanwhile, his Tea Party allies in Congress have called for the abolition of the entire National Organic Program! (Buffalo Field Campaign) A buffalo nation is coming! Almost all of the snow is gone now, save for a few shady north-facing slopes and mountain peaks. Hebgen Lake is opening up, turning back into water. Buffalo families continue to migrate through the Hebgen Basin and they dance with no snow to hold them back. Adult females are showing off enormous bellies and the first calf was just spotted by our lucky patrols early this morning! Here they come! 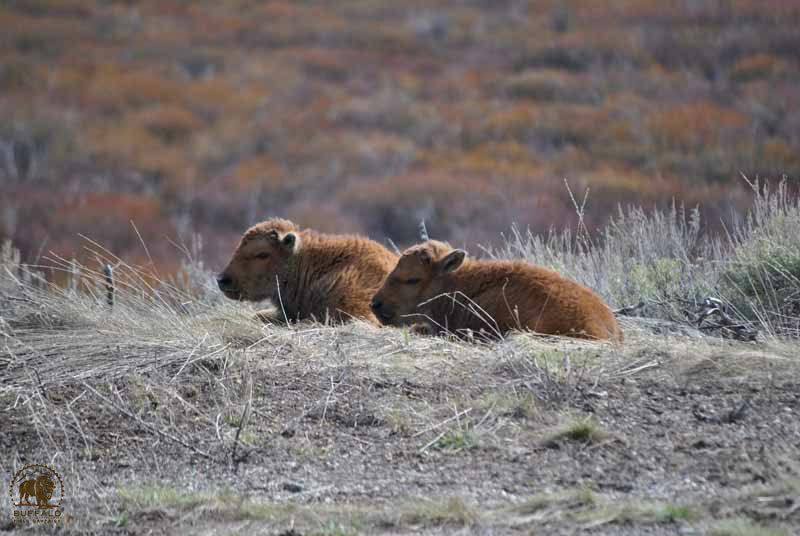 The next generation of wild buffalo, and most of them will grow strong peacefully in their new year-round habitat! A buffalo nation is coming! Almost all of the snow is gone now, save for a few shady north-facing slopes and mountain peaks. Hebgen Lake is opening up, turning back into water. Buffalo families continue to migrate through the Hebgen Basin and they dance with no snow to hold them back. Adult females are showing off enormous bellies and the first calf was just spotted by our lucky patrols early this morning! Here they come! The next generation of wild buffalo, and most of them will grow strong peacefully in their new year-round habitat! Have you saved the date? In addition to running daily and nightly patrols, we are also busy gearing up for our 20th Anniversary Party that will take place in West Yellowstone on May 26 and 27. Everyone is invited! It’s going to be a great event with home-cooked food, music, lots of buffalo family from over these many years, a field trip to see the buffalo and their brand new babies on their native habitat, a wolf-watching tour, and presentations on wolves, grizzly bears, bison, and their interrelationships. We will also have a silent auction featuring very special items. If you have any items you would like to donate to our auction, we would be honored to receive them. (Mercola) According to the World Health Organization (WHO), depression is now the leading cause of ill health and disability worldwide, affecting an estimated 322 million people worldwide, including more than 16 million Americans. Globally, rates of depression increased by 18 percent between 2005 and 2015.